As soon as the game begins, you need to start scouting. You want to know where you can expand, how you can best defend your base, and honestly whether your current map is worth continuing on at all. For example, if you spawn close to a Village of Doom, you’re going to have a very difficult time and may want to consider restarting altogether. Send your four starting rangers in opposite directions, making liberal use of the pause button to make sure they’re not getting trouble on their own. If one encounters more than a handful of zombies, move them in a new direction. You want to look for a safe path to expand your base in addition to good places to start collecting early game resources. You’ll need food — meaning forests and lakes to build hunting lodges and fisheries — as well as woods to build sawmills around so you can start collecting lumber. Early scouting also gives you quicker access to resource caches, which are tremendously valuable to give your economy a boost in the early days of the game. While you scout your surroundings, you simultaneously need to be starting your economy. You only have a limited amount of time between each wave of zombie attacks, so you want to be making the most of that by generating resources as quickly as possible. Population is one of the main limiters to how fast you can to expand, so you want to be cranking out as many tents as you can — and that will also add to your gold reserves. From there, you can start to worry about your sawmills and quarries. Don’t overspend on generating either stone or lumber early on, since any resources that go over your cap are going to go to waste. Your first major milestone should be getting is a soldier center, which will let you train a small army of rangers for early defense, and to clear out small zombie hordes in areas you want to expand. It might be tempting to wall yourself in from the start, but those resources can be better spent kicking off your early economy. A ranger on patrol is more than sufficient to hold off early wandering zombies — just make sure that every angle of entry to your base is covered. 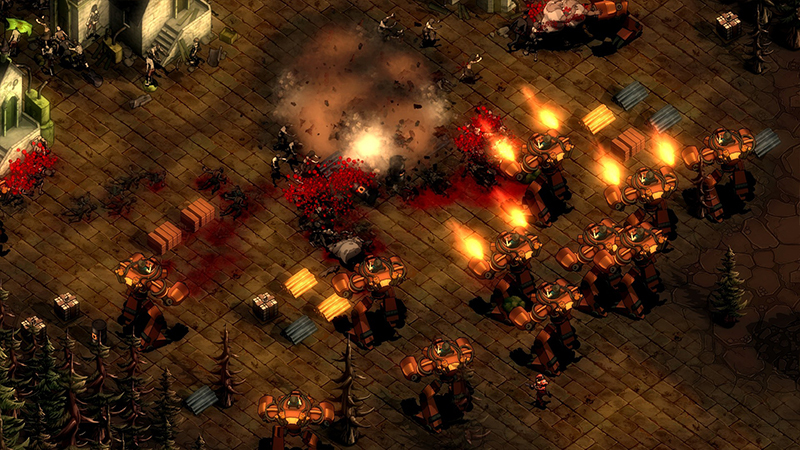 A single zombie is easily dispatched, but if it slips into your base and manages to attack a building, the infected structure will generate more zombies which then spread and attack more buildings. More often than not, that means game over. Too many walls also makes it more difficult to expand. Decide early on where you want your base to grow and build static defenses around those paths you have no intention of taking. By the mid and late game, you’ll want quarries for stone and iron, oil refineries on those nodes, and plenty of grasslands to take advantage of the incredible food production that farms provide. Focus your expansion on securing those resources so you can quickly stabilize your economy and growth. Then you can build solid defenses. Many buildings in the game can be upgraded, and knowing which will make laying out your base far simpler and easier. Basic tents can become cottages and stone houses, and farms, quarries, and mills can be upgraded for better production. There’s nowhere this is more important than with your defenses, though. 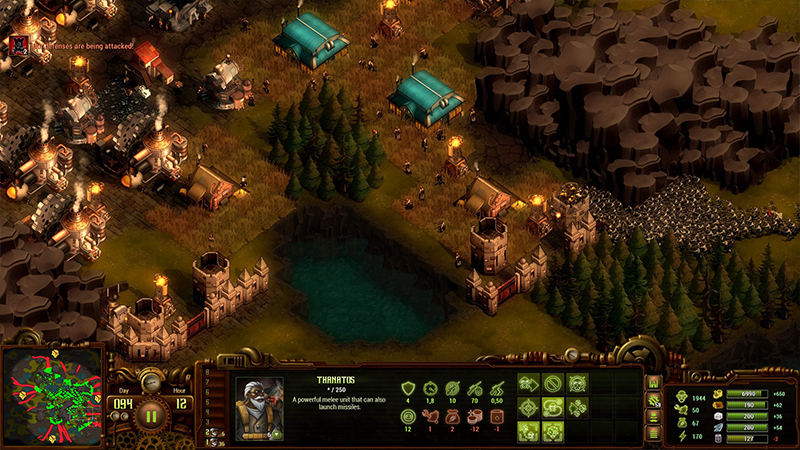 Wood walls, towers, and gates can be upgraded to their stone equivalents, and even ballistas can be upgraded to the zombie-shredding Executor towers late in the game. Keep an eye toward the upgrade path so you know what can be easily upgraded without altering your layout. 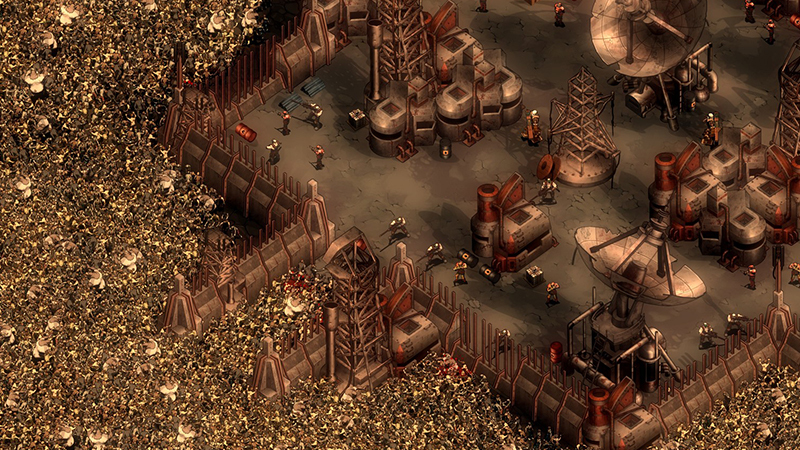 Though the heart of They Are Billions is building defenses, that doesn’t mean you can spend the entire game waiting for the zombies to come to you. You’ll want to be proactive about clearing out nearby hordes from the start, opening up new avenues for your base to expand — you don’t want your economy stalling while you wait for your army to chip away at a big group blocking your path. Once you’ve got your soldier center, get a band of rangers together to thin the herds. Their mobility and inexpensiveness make them an excellent option for early excursions. From there, you’ll want to invest more heavily in snipers and Lucifer units, which respectively make excellent early-mid and late-mid zombie hunters, and will both be quite powerful later on as defensive measures — more on that below. The walking Titan mechs, of course, are the most powerful units, and a relatively small squadron can easily clear out the entire map once you reach the later stages of the game. Just set them to chase mode and wait while they destroy wandering undead. That’s not just for fun, since incoming waves draw in wanderers when they attack, and you’ll want every advantage you can get against the massive final attack. 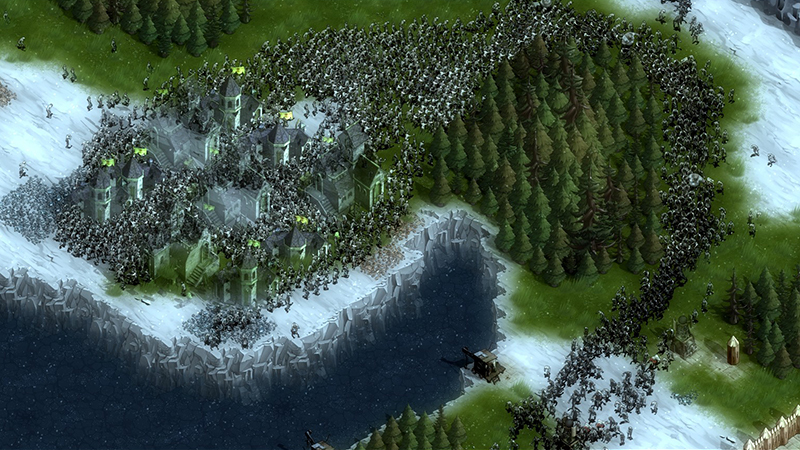 Once it comes down to it, you just have to hold out against incoming hordes, and that all comes down to solid defenses. 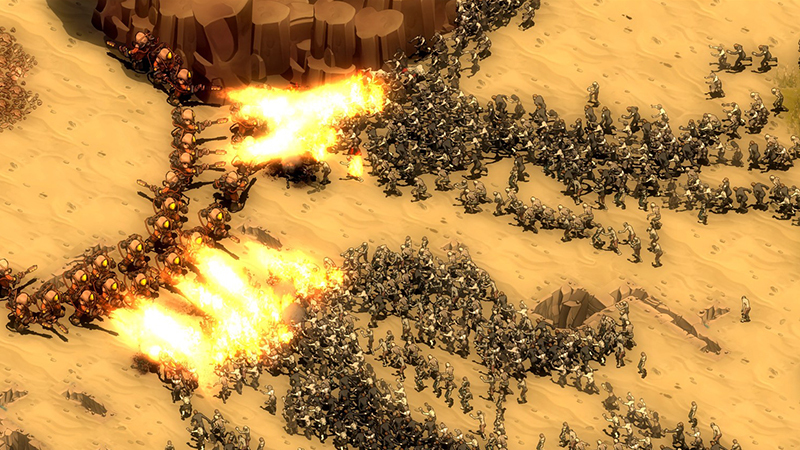 You’ll want to build double stone walls against every avenue of attack, buying as much time as possible for your damage dealers to thin the hordes. Once you start getting to the advanced waves, you’ll want to layer those defenses — walls, then a row of towers and turrets, then more walls. From there, you can have your standard troops do backup. Snipers in particular are excellent in defensive positions, and you’ll want to make sure to set their attack priority to aim at the most dangerous enemies. Their highly damaging shots can take down specialized zombies while your other defenses thin out the herds — and you’ll want to make sure you’re similarly managing your other regular units for effective defense. Once you’re down to the final stages, you can also send your Lucifer units outside the walls to be a first fiery brigade against incoming waves: just make sure your other units don’t get caught in the flames. With some smart defenses, even the biggest zombie horde will be rendered ineffectual. 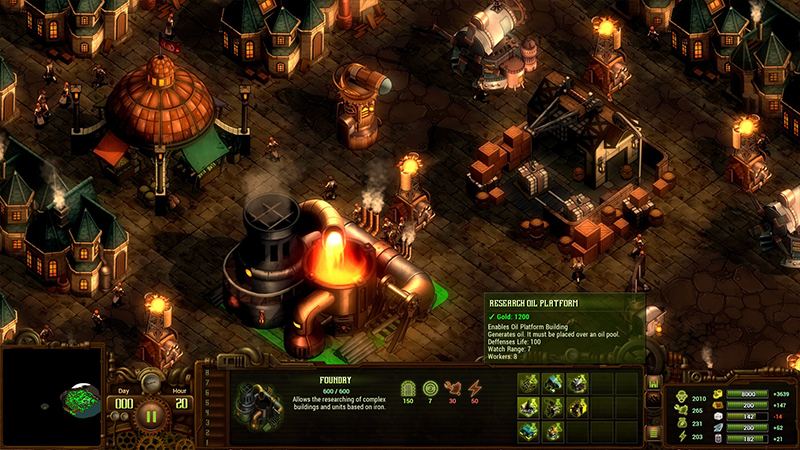 For more details on all the units and buildings you’ll need to make use of, check out the They Are Billions Wiki. 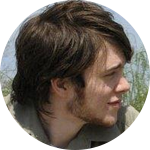 Dustin is a Missouri-based freelancer who enjoys long walks in digital woods. When he's not writing about geeky pastimes, he's producing videos on them. He and his wife bond best over tabletop role-playing.